Purdy, right?! I might be crazy, but I think this looks like something you’d pay big bucks for at Pier 1 or Pottery Barn. Ok, let’s get into how I made this in 10 minutes. 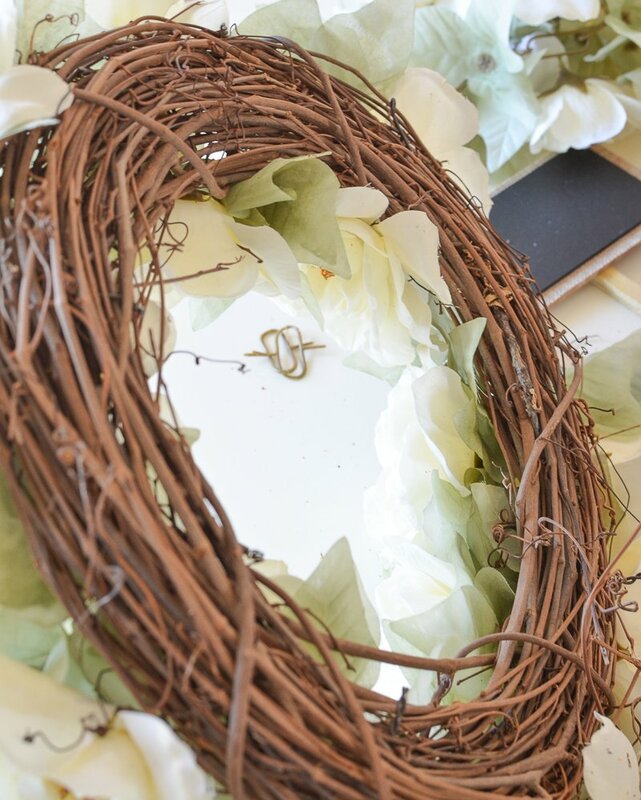 Before I get into the tutorial I have to tell you how I got the idea for this wreath. So I was in Michael’s the other day, as usual, and I was admiring all of their fall garlands. Most of them were a little too flashy for my style, but one of them in particular struck my fancy and I started thinking to myself how awesome it would be to have a fall wreath with the same design/flower combo. 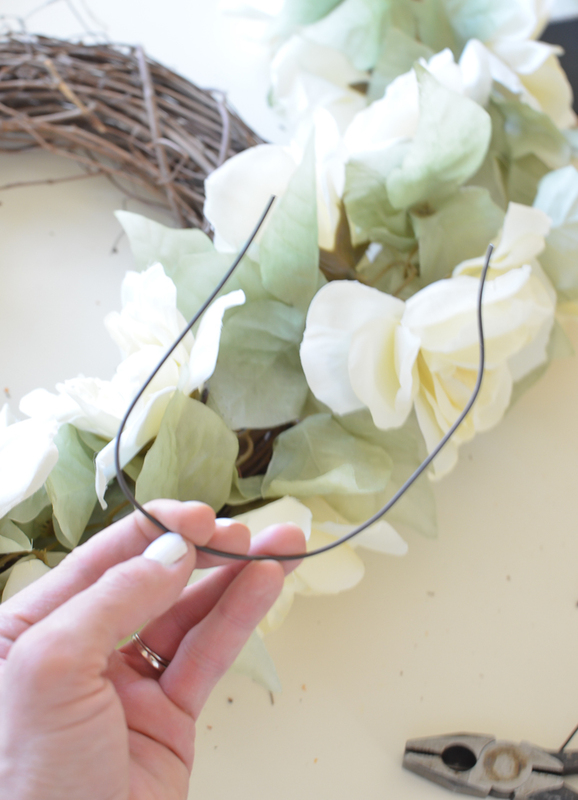 And then it hit me–why not turn this long garland into a wreath myself?! So I snatched it up, grabbed a grapevine wreath, and hurried home to make it happen. 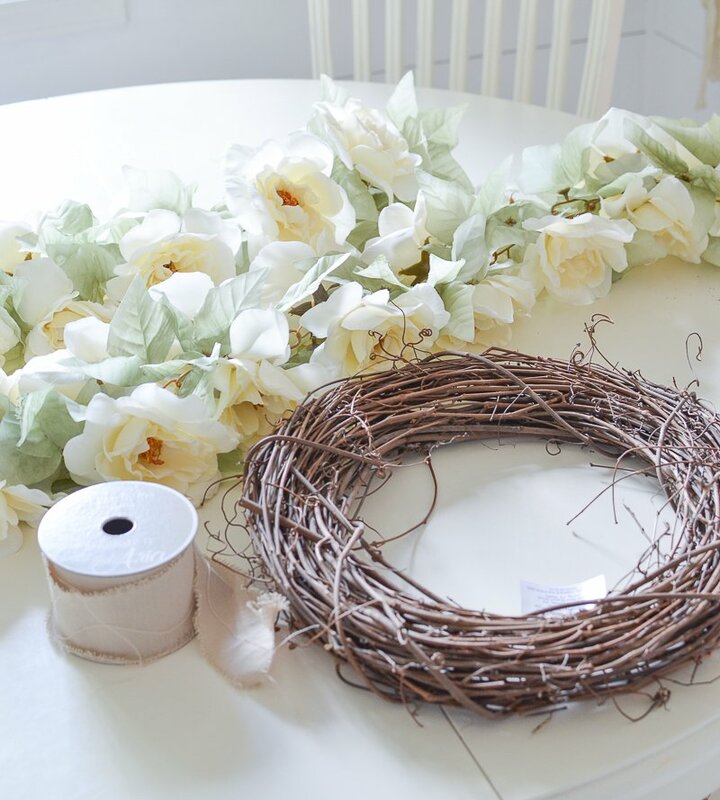 The first step was cutting the garland to size to wrap all the way around the grapevine wreath one time. Thankfully it had this easy plastic chainlink design, so I just laid it over the wreath to measure how much length I needed and then I snipped it with a pair of scissors. EASY. Next up I grabbed some wire and I made several little makeshift pins like this guy here to help secure the garland to the wreath. I simply laid the garland on top of the wreath, secured one of the pins in place over top, and then pulled it tight to the back of the wreath. Once I had it in place, I twisted the two sides of the wire together and got it nice and snug on the back. I did that in six places around the wreath. Once I had the pins through the back side of the wreath I trimmed them all down with wire cutters so nothing was sticking out too long. And that was literally it. No glue gun needed. No trimming tons of little greenery and floral stems. Nothing but the garland, a few pieces of wire, and a grapevine wreath. Done in minutes! I wasn’t sure how this would turn out when I started, but I’m pretty excited about how it came together. 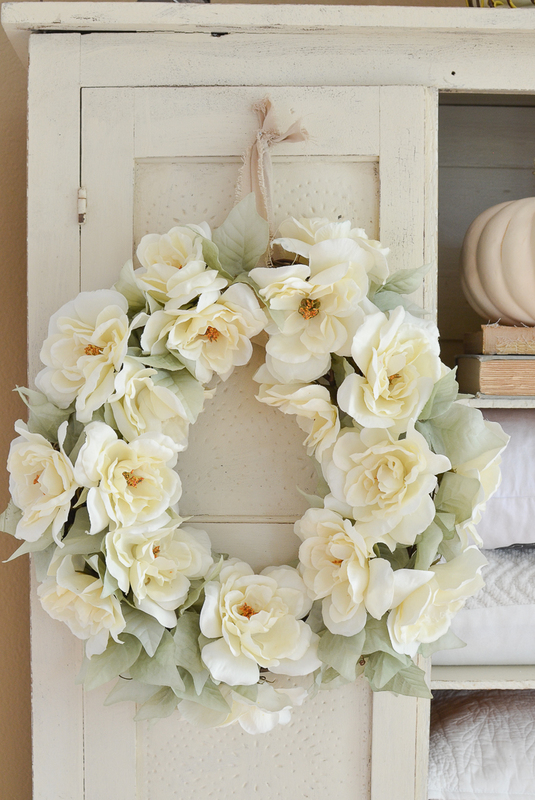 I did plan to glue a few little white pumpkins on the wreath just to make it more fall-ish, but to be honest I loved the way it looked just like this, so I decided to leave them off. 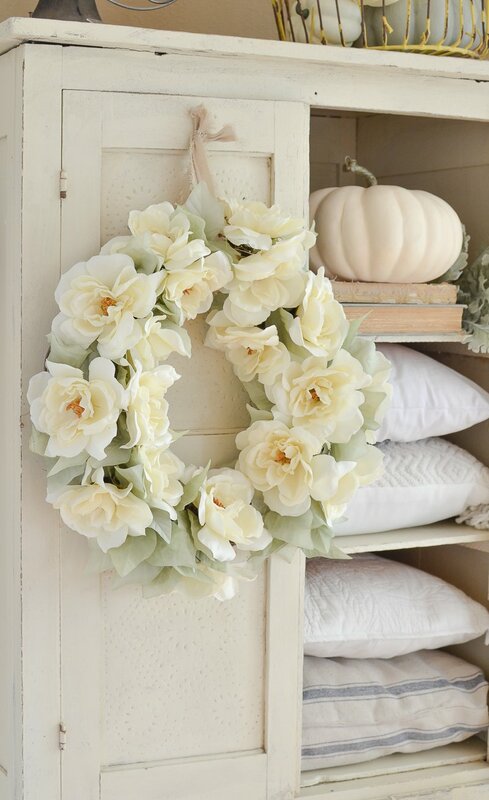 And the fun part is that this wreath idea would literally work with just about any garland. So if you want one with lots of pumpkins and pinecones, there’s probably a garland out there that would work just as well. Just make sure it’s nice and flimsy like this guy so you can work with it easily. And aside from being the easiest DIY wreath ever, the best part is that this wreath doesn’t look like an obvious DIY project. It kinda pulls off the real-deal, expensive wreath look, huh? But in reality it only cost me about $15 after I bought the garland on sale at Michael’s. (And with a coupon–whoot!) So simple, so easy and pretty darn cute too. I might just leave this up year-round I love it so much! Pretty but certainly not Fall. Oh my goodness!! I love this so so much!! I have tried DIY wreaths before and they’ve turned out okay, but when it was all said and done they ended up being expensive to make. I’m excited to give this a try! Thank you for sharing! Did you just go around the wreath once with the garland? Yep, just one time around! Very pretty! I agree that it would look great year around. 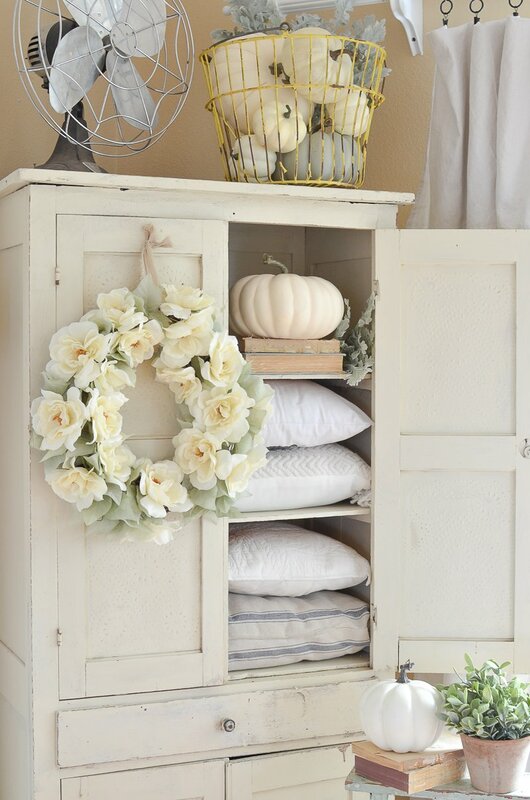 If you did want to change it up a bit for different seasons, you could add in some of those inexpensive floral picks (I buy mine at Hobby Lobby, on sale of course, usually in the seasonal area, but Michaels may have them as well). They can just be tucked into the grapevine wreath in between the flowers. 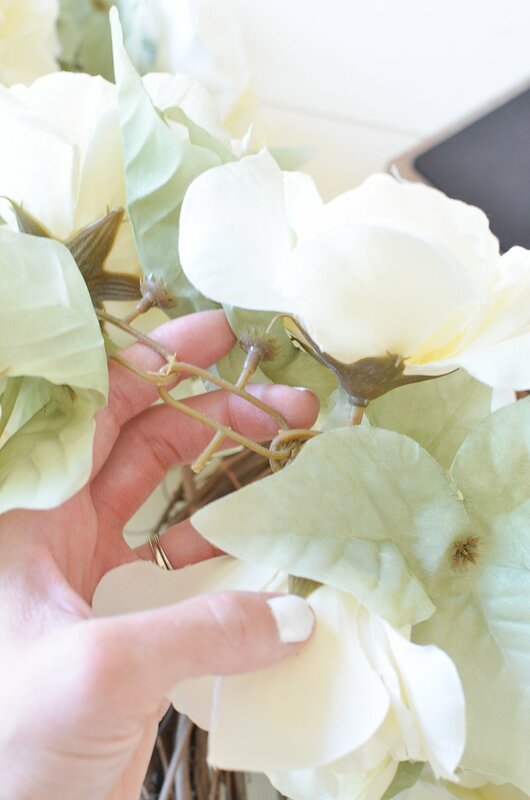 I used to have a giant grapevine and greenery wreath in my home and that is how I changed it up for the seasons. Something like berries, tiny ornaments, fall leaves, etc. But it is beautiful as is! I will definitely look at garlands in a new way. Those pre-made wreaths can be super expensive! Yes, I like the addition of berries. It’s so pretty! It really does look like a high end wreath. Oh my goodness, this is precious! Great job Sarah, thank you for sharing and for the inspiration. Definitely trying this and will stock up on garland when it’s on sale! 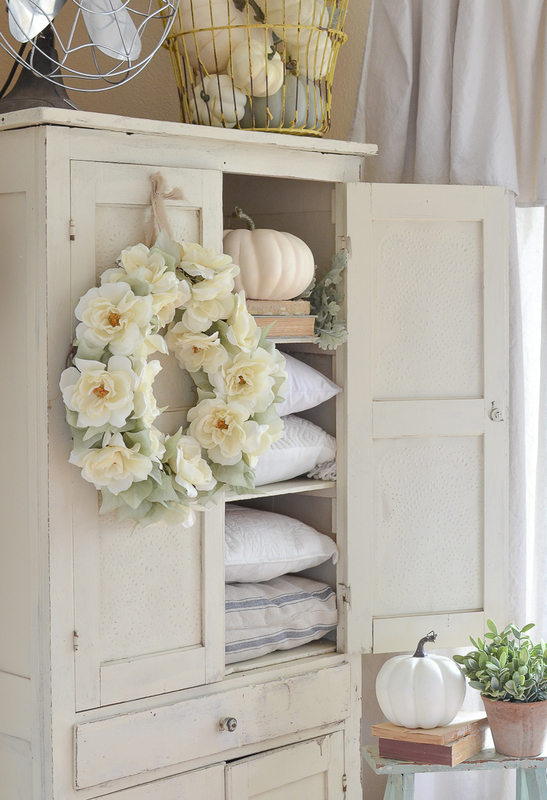 Beautiful, and paired with the white pumpkins gives it a fall look. 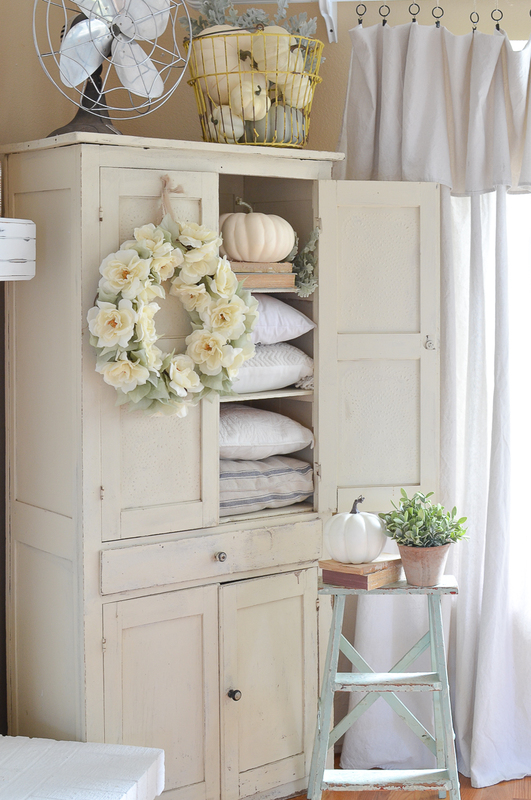 Not all fall decor has to be orange and black. I love this so much! It’s so beautiful, I love anything white! 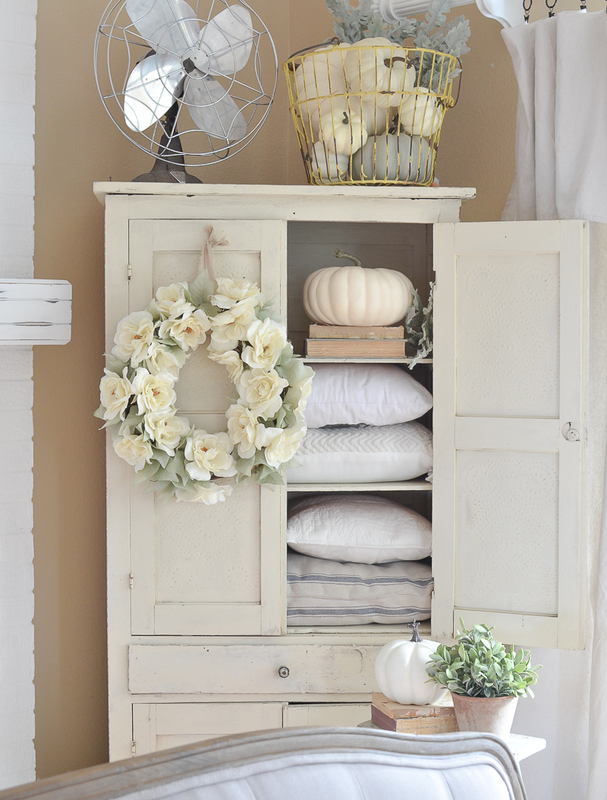 Just the simplicity of it with the white pumpkins! Thanks Sandra, I am so excited about how it turned out! Love the simple beauty! I’m heading to Michaels! Thank you for sharing your talent! Sarah..That “Really? !” wasn’t for you! Oh I know Sherri! Thanks for your support sweet friend! And good lucking finding a similar garland online, I should have linked up a few for you guys in my post. Maybe try looking on Etsy or Amazon! Love this!!! I had to pin it so I don’t forget!! This will be my next DIY. Thanks for sharing!! Love your blog too!! Where did you buy the grapevine wreath? I bought that form Michael’s as well! It’s beautiful Sarah! 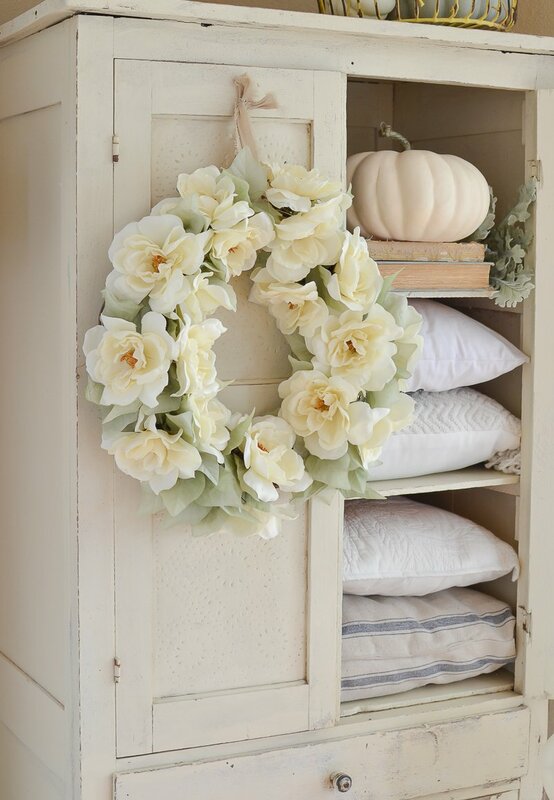 What a perfect way to make a new wreath! I love the pop it adds to that corner of the room too. Love how simple this is, Sarah. ♡♡Sharing!! thank you so much Larissa, I really appreciate that!! Wow! 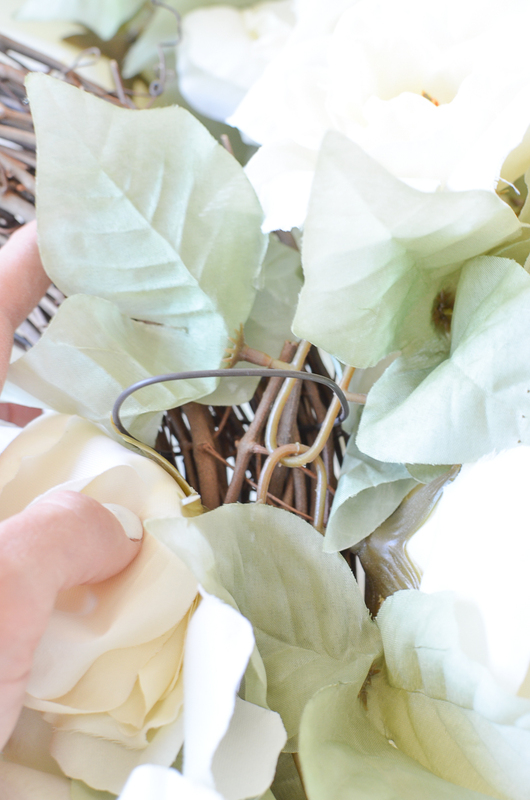 What a beautiful wreath and I can’t believe how easy it looks to make! I think I may even be able to make it and I’m craft challenged!